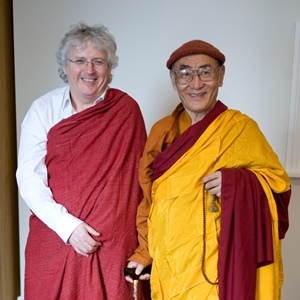 Lama Jampa Thaye is a scholar and meditation master trained in the Karma Kagyu and Sakya traditions of Buddhism. He is authorized as a lama by his two main teachers, Karma Thinley Rinpoche and His Holiness Sakya Trizin, and has been training students in all aspects of the Buddhist path since 1988. Lama Jampa Thaye visits Kagyu Ling Buddhist Centre Manchester several times each year to give teachings and interviews to sudents. Master of the Kagyu and Sakya traditions of Buddhism, Rinpoche was born and trained in Tibet before leaving his homeland in 1959. Fourteen years later, in 1973, Lama Jampa Thaye met Rinpoche in the UK and became his student. His Holiness the Seventeenth Karmapa Thrinley Thaye Dorje is the head of the Karma Kagyu tradition of Buddhism. His Holiness has visited Kagyu Ling Buddhist Centre Manchester on two occasions, in 2009 and 2013. The 14th Kunzig Shamar Rinpoche (1952 – 2014), the second most senior lama of the Kagyu tradition, made a historic visit to Kagyu Ling Buddhist Centre Manchester at the beginning of June 2014.